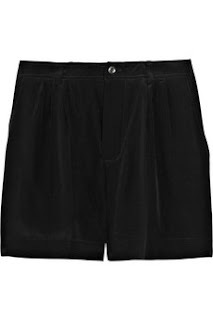 I've loved these shorts since I saw them in the AW10 collection - just a good, trusty pair to own. I've only ever had a T shirt from Miu Miu, which I bought at a sample sale a few years ago. Having been worn to death, it is still going strong and any friends who have the high fashion brand's stuff seems to say similar things. In a nutshell, I feel confident investing in them. These shorts are now on theoutnet.com, reduced from £260 to £90 - so I've been a bit naughty and bought them. They're silk crepe so they have a little bit of va va voom - you wouldn't be able to buy this quality on the high street... Have I justified this purchase enough yet?! Definitely justified :) They're really lovely and that's a pretty good discount!